The ferry from the Cape brought us into the port of Yamagawa at around 6 o’clock, leaving us not much daylight to find a camp spot. (When did it start getting dark so early!?) 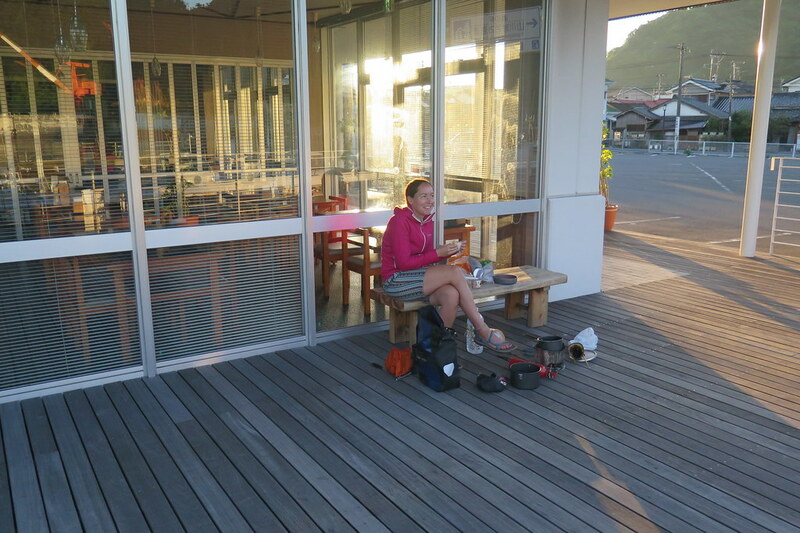 Luckily there was a michi no eki around the corner from the ferry terminal which we immediately gravitated towards to cook some dinner and pitch our tent. We positioned ourselves under a shelter, and next to a power socket, so we could plug in our devices for a cheeky overnight charge. The evening’s generous strangers were a couple from Nagoya, touring in their van, who gave us some of their veggie and tofu stew, and then a few mikan oranges. 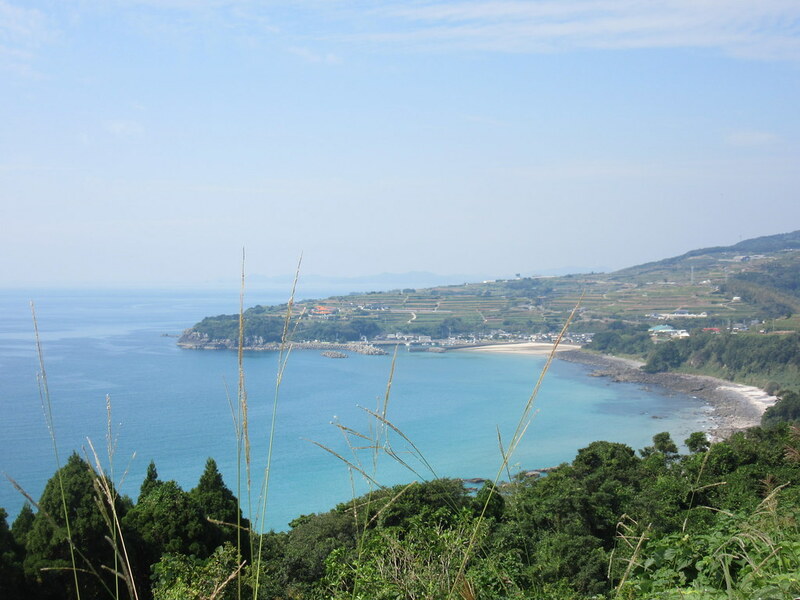 The next morning, we were cycling the 50km up the coast to the Kagoshima, the largest city in this part of Kyushu. On the way up, the huge volcano on Sakurajima came into view. This is one of the most active volcanoes in Japan, often billowing ash from its crater. It’s right opposite the city and frequently erupts, the most recent eruption being in the spring of this year. Everything was still and calm on this sunny day though. As expected, getting into town was busy, but we took our time cycling and enjoying the view, then took a mid morning ice cream break halfway. We’d booked a hotel for the night in the city centre, another cheapy deal on booking.com which turned out to be a real bargain. 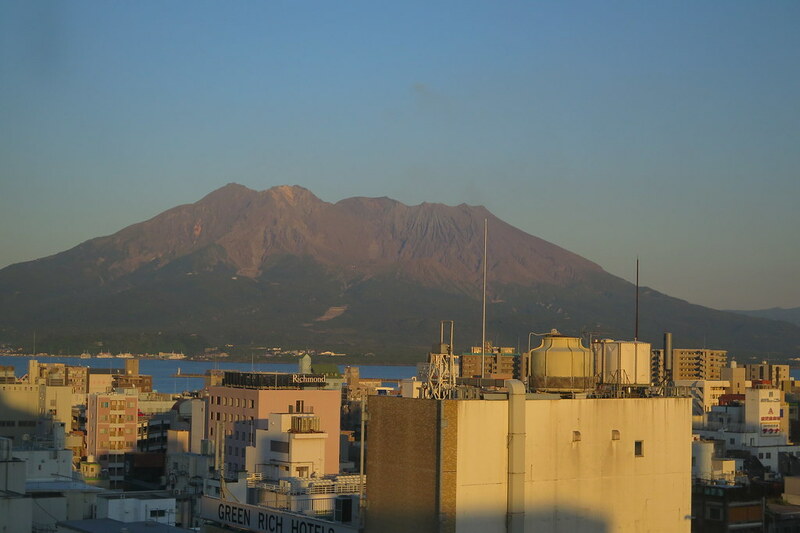 We had a great room on the top floor overlooking the city and over to Sakurajima. We made the most of having a roof over our heads, did some laundry and then went out for yakitori and a few beers in the city that evening. More by luck than any planning on our part, the hotel was right on a riverside cycling path that took us northwest out of town the next morning. After a lazy start and some brunch, we followed this for about 15km or so, avoiding the busy Route 3. 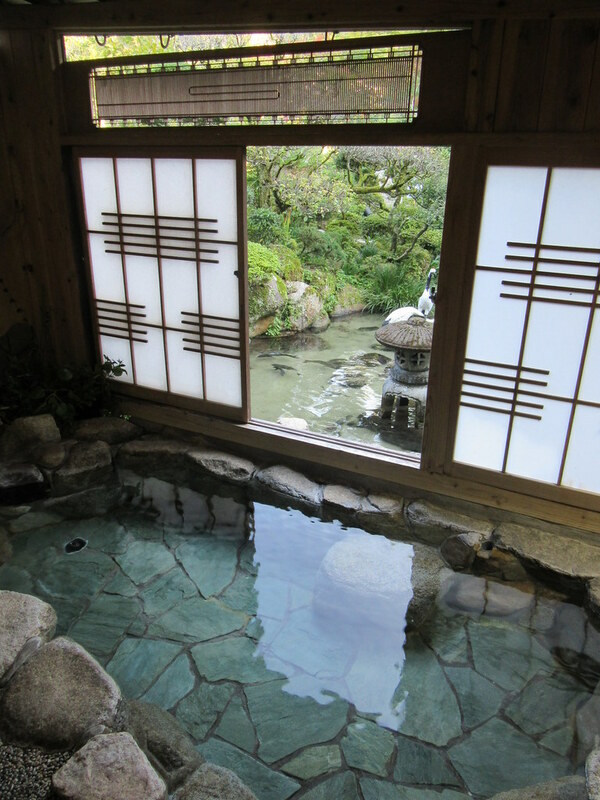 We only had a short day planned, to get a little way out of town to stop for the night at Ichikikushikino. Say that name quickly 5 times. We arrived in town and headed out to the beach. Empty apart from a couple of fishermen. We found an old lookout tower that we pitched our tent in overlooking the beach, facing west. 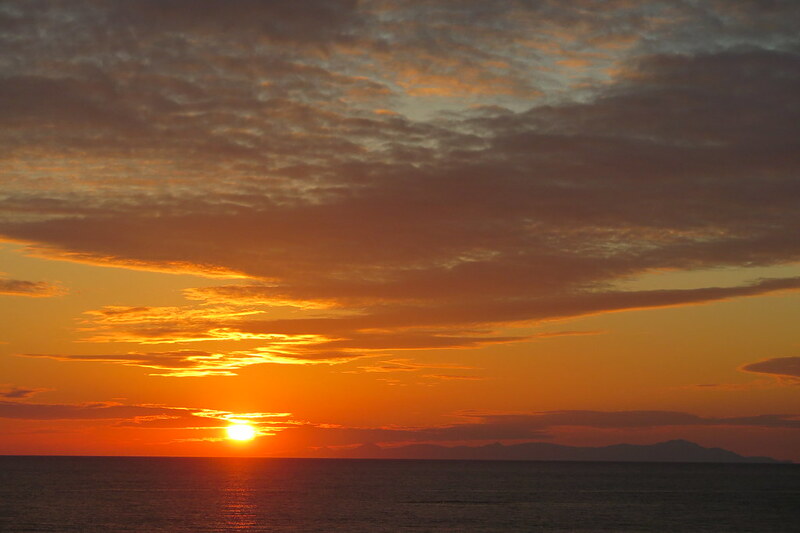 Yet another sunset to end the day, probably the best we’ve seen so far. Planning the route for the following few days, we had originally looked at the main road following the west coast. It looked like quite a busy road going through towns, with nothing particularly interesting on route. Clare spotted a few islands off the coast linked by ferries and bridges so we decided to head that way. 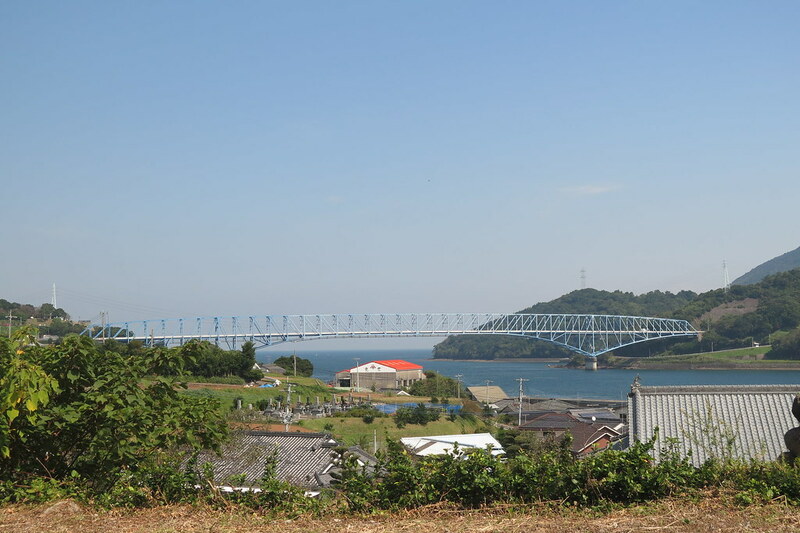 From Ichikikushikino (last time I’m typing that) it was a quick but hilly stretch on Route 3, to get up to the bridge over to the first island, Nagashima. 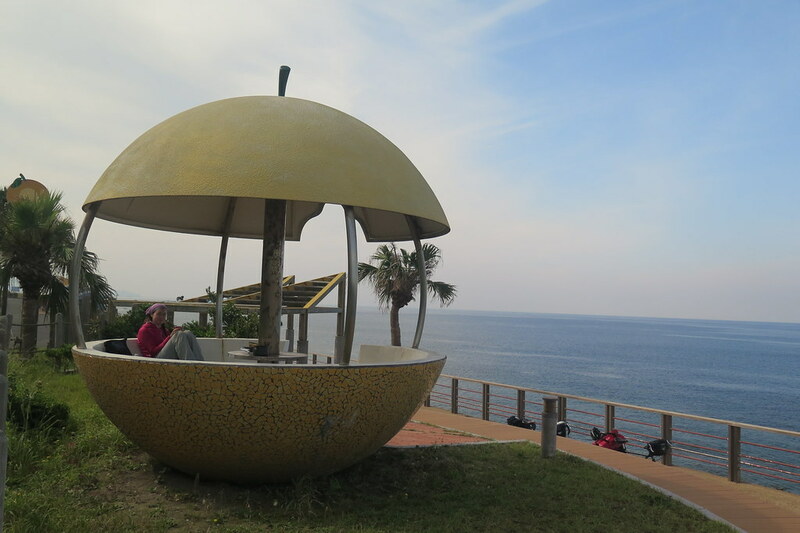 On the way, we stopped for a coffee in a giant satsuma picnic table at a michi no eki. 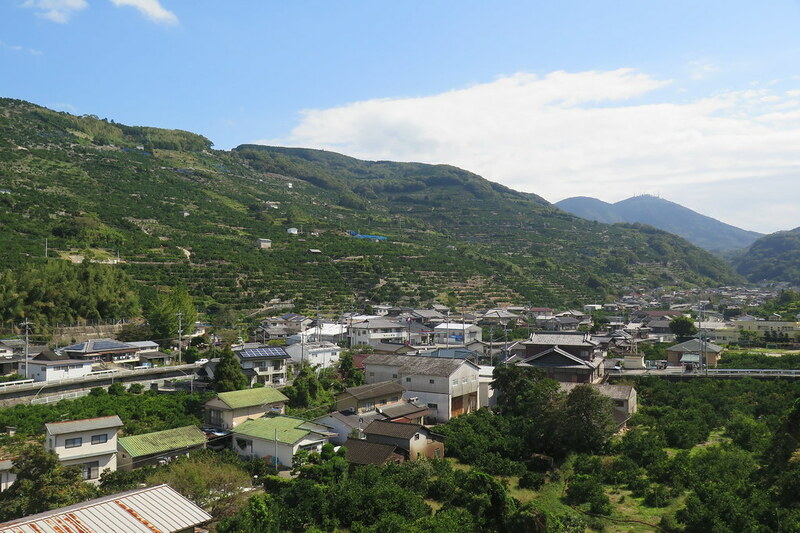 This area is the Satsuma region, growing loads of citrus fruit on its sunny hillsides. 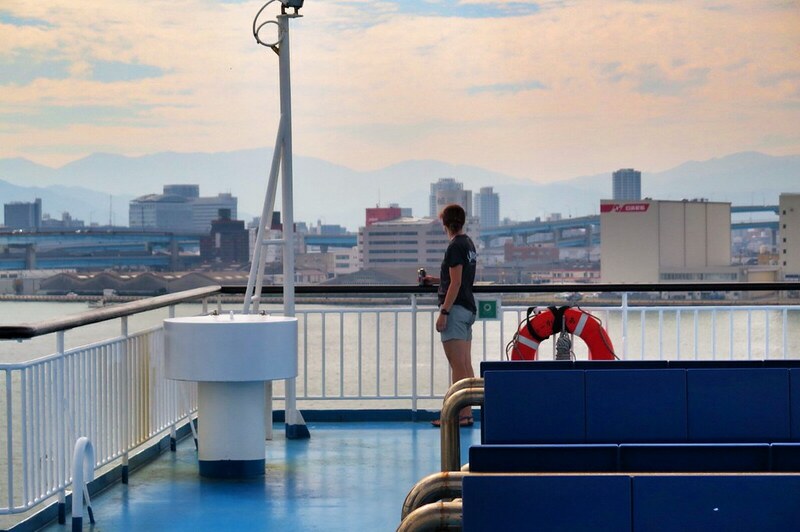 Once we got over onto Nagashima, we spend the next couple of days working our way generally north, over bridges and via a ferry between islands that looked more like Greece than Japan. Beautiful rolling hills covered in fruit trees which dropped down to rocky beaches and coves. The riding wasn’t the easiest with the hills and some headwinds. We put in a couple of long days too, including a 110km ride, our longest so far. We did reward ourselves though, with some great food stops making the most of the local seafood. 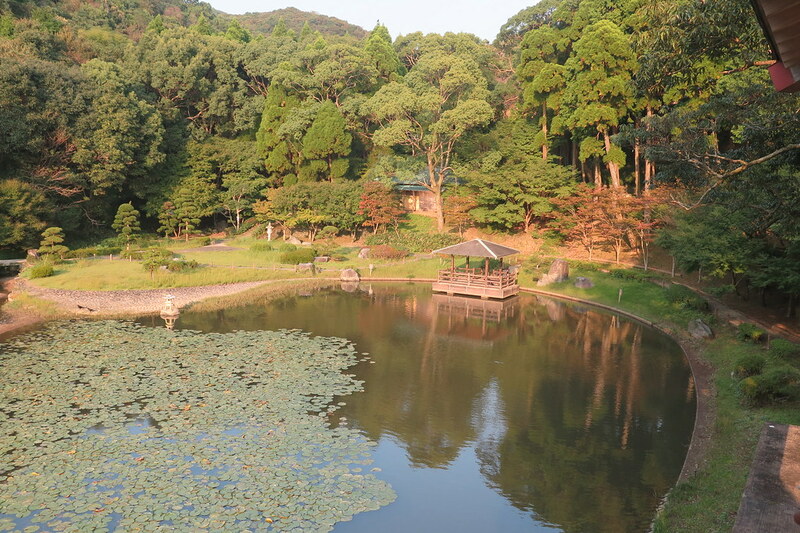 One night we camped in a traditional Japanese style park next to a koi pond. The next was under a shelter at a mich no eki, luckily for us as the weather broke and we had our first rain in well over a week. We also met our first foreign touring cyclists, Stuart and Sheila, a British American couple from near Seattle. 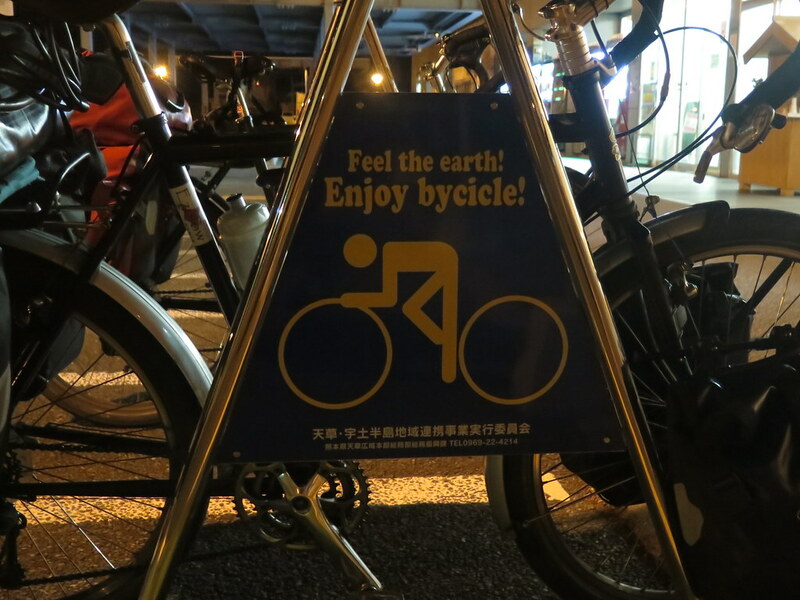 They’re here for over a month cycling around southern Japan and by the sounds of it, thoroughly enjoying themselves. We had a couple of days of greyer weather, but very little rain. The nights have been feeling a little colder as we’re moving north too. I guess it’s mid October now, so some more autumnal weather will no doubt be coming our way sooner rather than later. 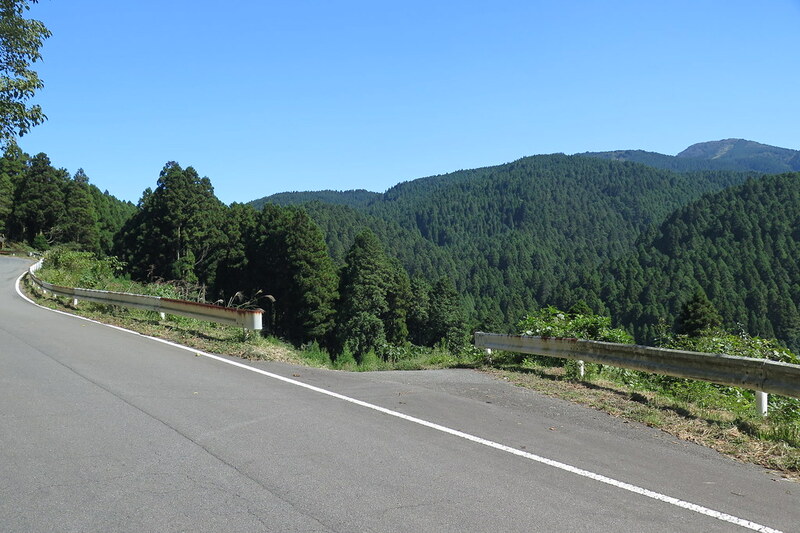 But once we got north of Saga City, for our last couple of days in Japan we had yet more blue sky and warm temperatures. 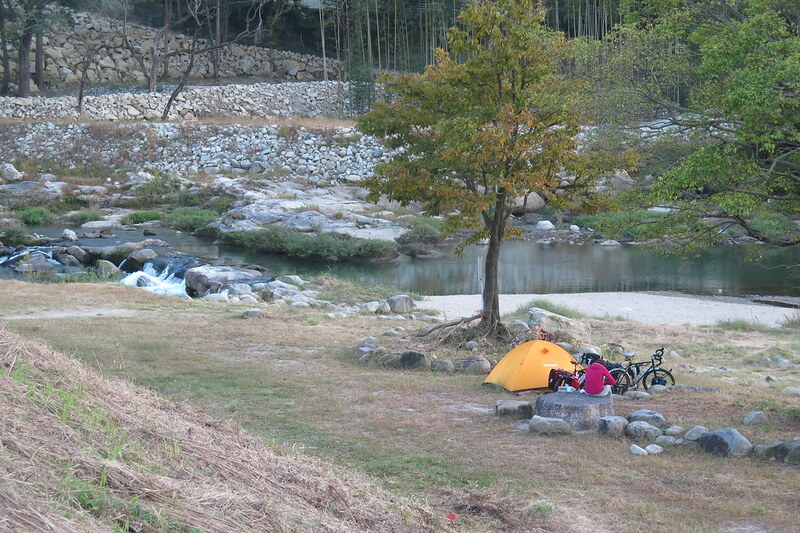 On our final night under canvas in Japan, we found the ultimate wild camp spot. It’s really incredible how easy it is to find somewhere to pitch your tent. It’ll be quite an adjustment when we’re in other countries and need to be more stealthy about where we bed down for the night. 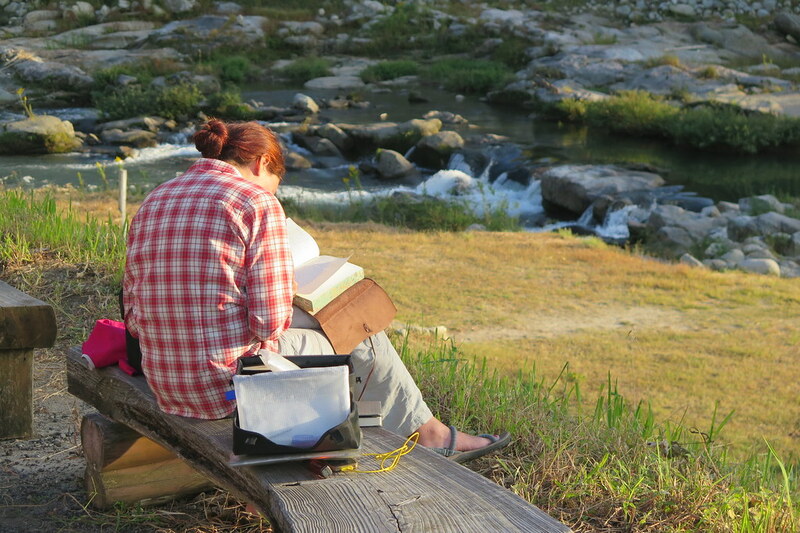 In the town of Yamato just next to another great michi no eki, we camped on a grassy riverbank in the hills. We were completely undisturbed, setting up our tent way before nightfall and then then the following morning taking our time packing up and getting moving. 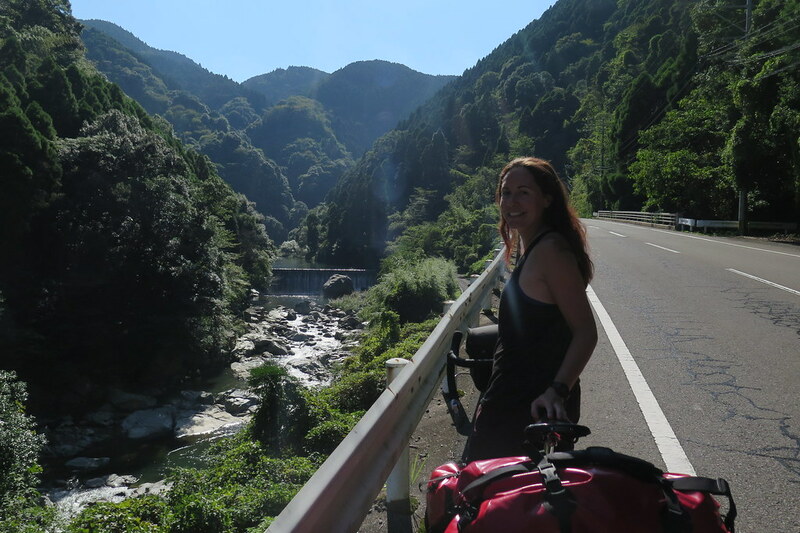 It was only a few kilometres upstream from where we camped, in the onsen town of Furunoyu. 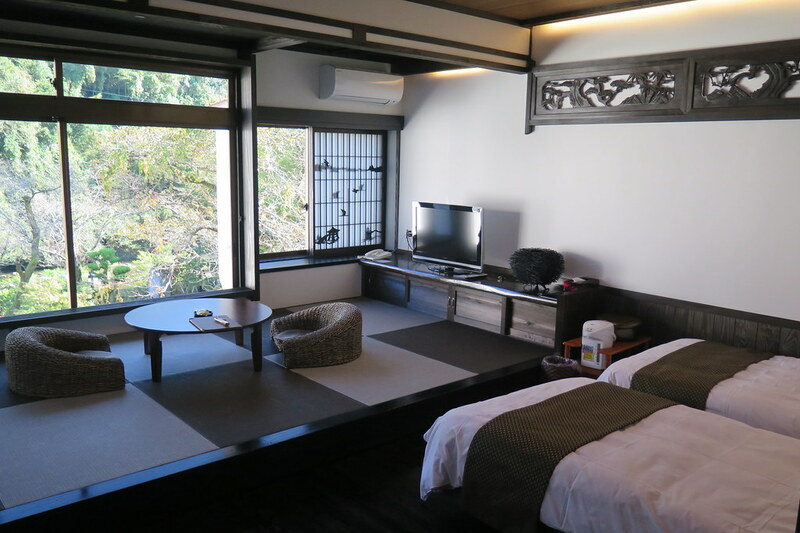 We checked in, changed out of our cycling clothes and enjoyed the evening in our tatami room, private onsen and delicious food. 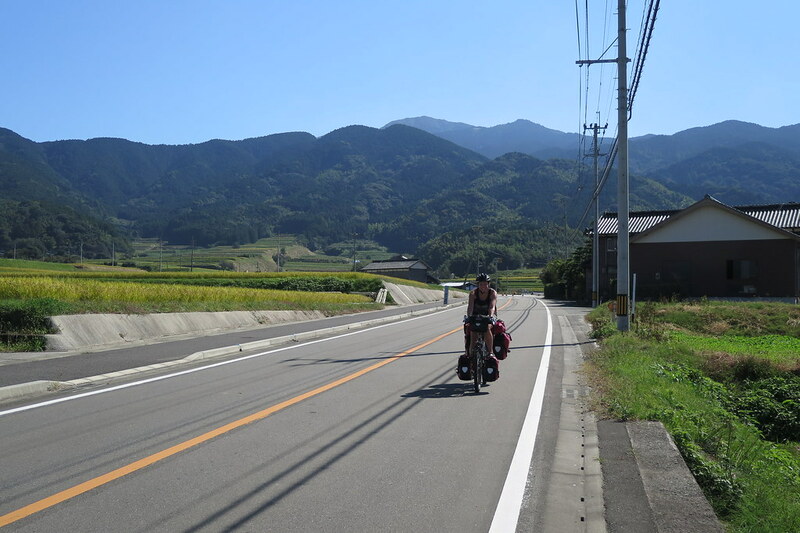 The next day, from Furunoyu up to Fukuoka, our final stop, was only going to be 50 kilometres or so. 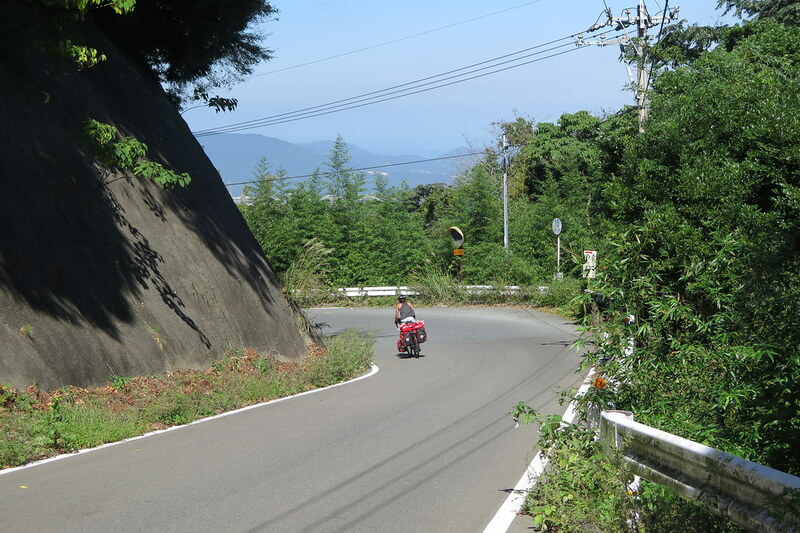 But it did include quite a steep climb over a mountain pass. We were a little nervous about it, not having had to cross any significant passes for a while, but it turned out to be a great final day. The weather again was beautiful and although the climb was steep, we both were in really good spirits and I think, by now, our legs are in decent shape. Once at the top, the descent all the way down to sea level on the other side was a solid half hour of effortless fun. 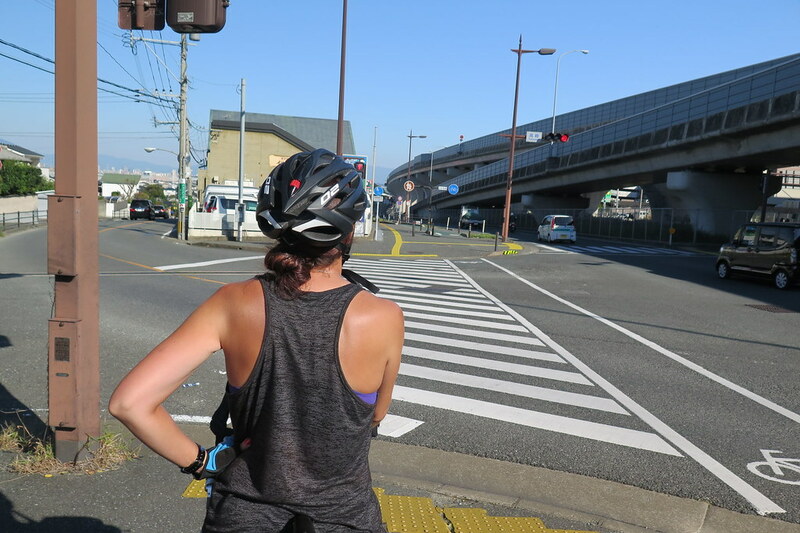 Riding into Fukuoka, Kyushu’s largest city was also relatively painless. 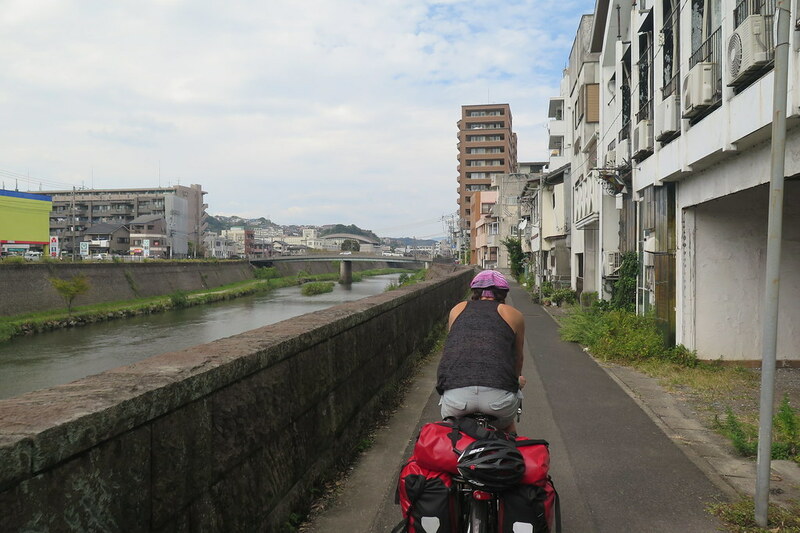 Fuelled by our lunch of Tonkotsu ramen (noodles in pork bone soup, the local speciality) we lucked in and found a cycle path running alongside the main road into town. We stopped at a couple of shops on the way in to pick up a few bits and pieces and then arrived at our hotel in the city centre by mid afternoon. 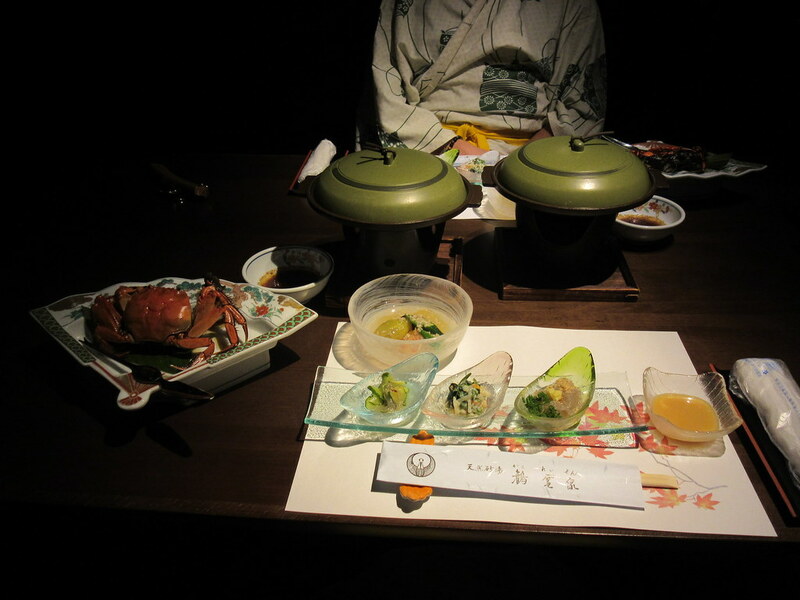 We had a final night out at an izakaya but were back in the hotel room for a relatively early night. Our ferry left the following day from Fukuoka’s international ferry terminal. Loading our bikes was a bit of a pain as we had to check them in as luggage rather than wheeling them onboard with the cars and other vehicles. Especially when the baggage handler guy dropped Clare’s bike when he loaded it into the container. It was a sad moment when we sailed out of the port. A surreal goodbye that we’d known was coming, but that hit us both pretty hard nonetheless. But, we’re into a new country now, and new adventures await! 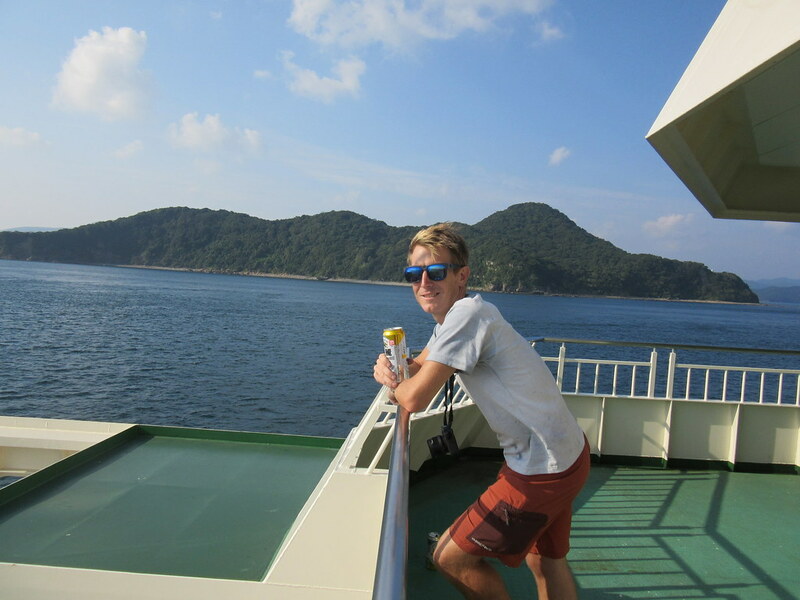 Our route up through Kyushu from Cape Sata. Great blog guys. Enjoying reading every bit. All the best for the next part of your adventure. We’ll be following you all the way. Cool picture at the dinner table! 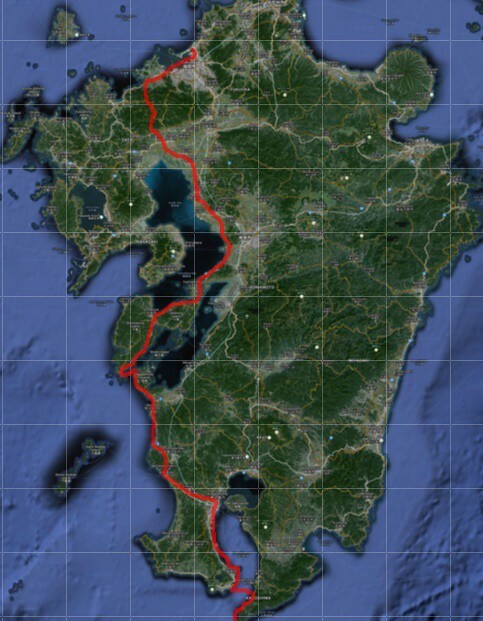 We’ll be making our way to Fukuoka soon and then to Kagoshima (we’re cycling around Jeju now), so might repeat part of your route. By the sounds of it, your map must be much more detailed than ours… What scale is it, is it in English, and how can we get a hold of one? Our map was the Touring Mapple. Luckily there is a version containing both Kyushu and Okinawa (九州 & 沖縄). You can get it in most larger book shops in Japan, certainly in downtown Fukuoaka you’d find a shop that stocked it. It’s mostly in Japanese, but the names of most towns are written in English so you can get a good idea of things. The road signs all have English names and Japanese. The scale is 1:140,000 for most of Kyushu and 1:250,000 for Okinawa. Perfect, thanks, we’ll try to pick up a copy in Fukuoka then. I can’t believe they actually have convenience stores on a map! Could be convenient though 🙂 How easy was it to eat out / stock up on the road in Kyushu? In Korea we have been carrying a few dinners and breakfasts, sorting lunch on a day to day basis, and usually eating out when the opportunity presents itself. 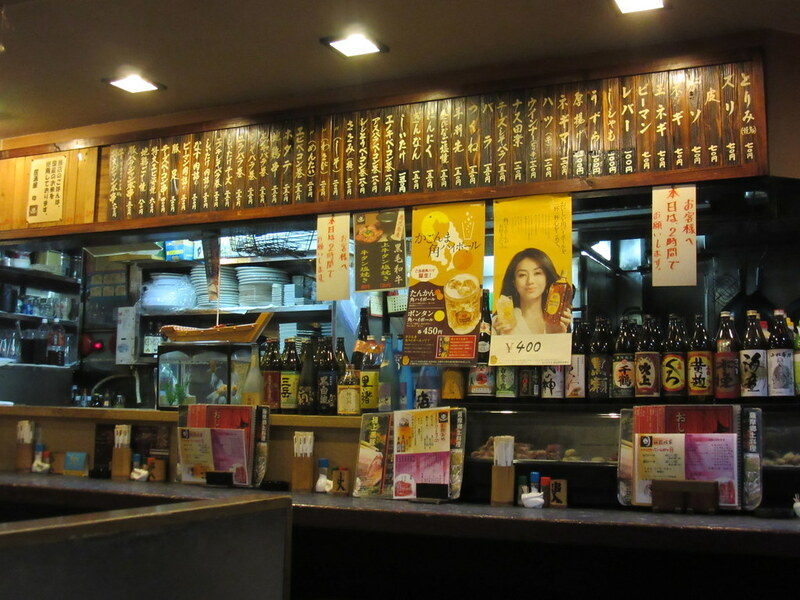 I’d say there’s more restaurants and places to eat on the road in Kyushu than in Korea. It’s a little more expensive generally though. There are more convenience stores which stock a wider range of food and quite a few supermarkets even in small towns. 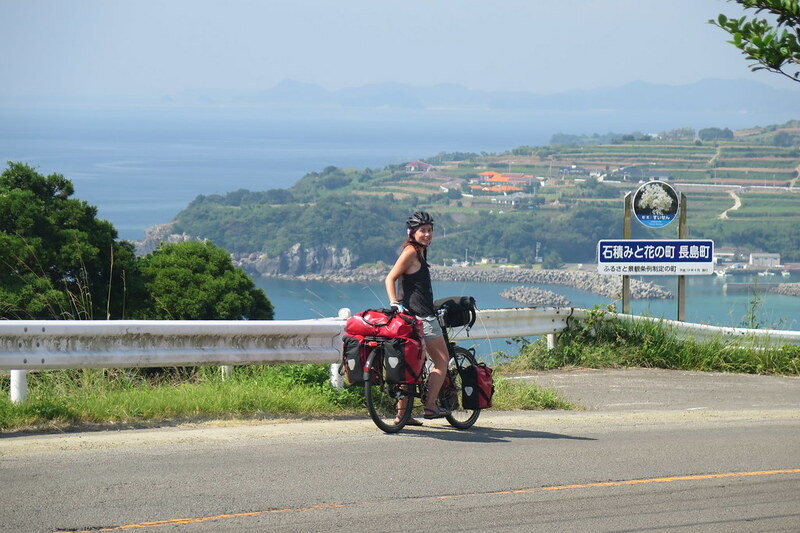 As you’re on the road, you’ll pass a lot more than when following the cycle paths in Korea. We’d generally load up veggies etc when we saw a supermarket or local store to cook for dinner. 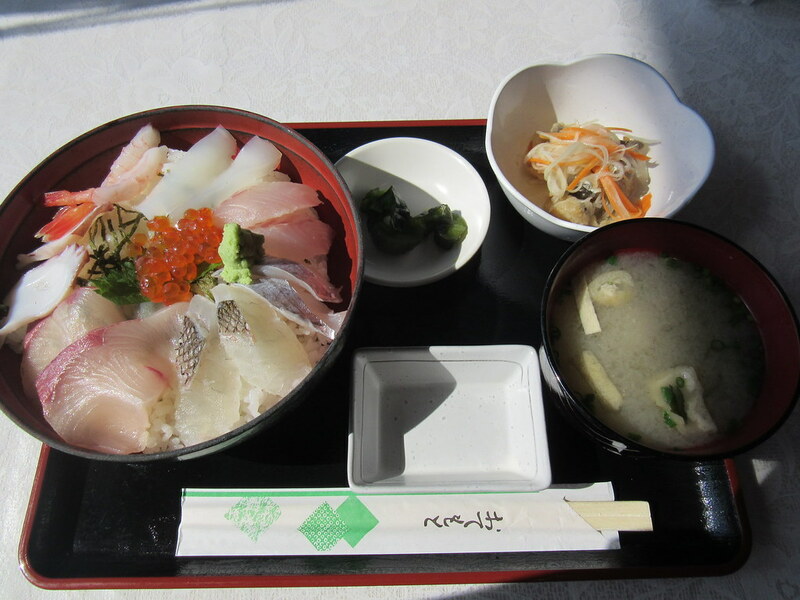 Then get lunch at a restaurant of from a convenience store. One or other would usually appear before too long! That suits us perfectly! Thanks for the info. 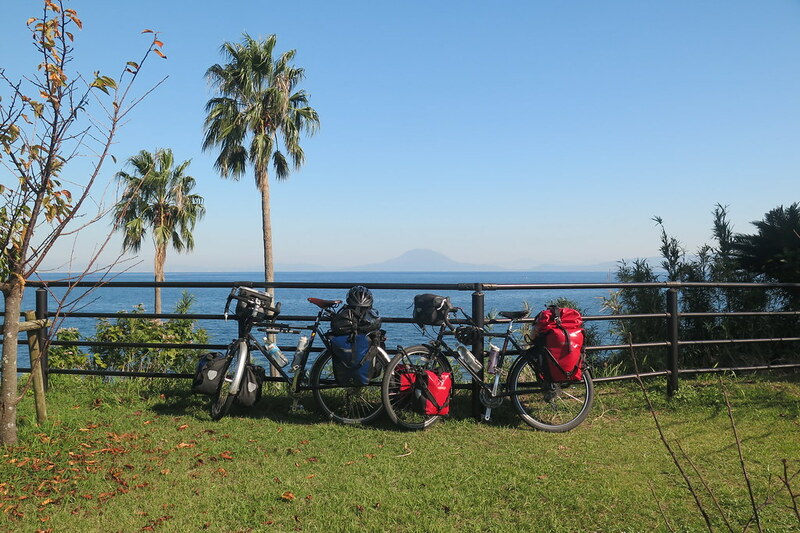 We’ve been enjoying following your progress… We’re about to finally cycle into Kagoshima. We’d like to hook up with that river cycling path you mentioned to avoid car traffic when entering Kagoshima. 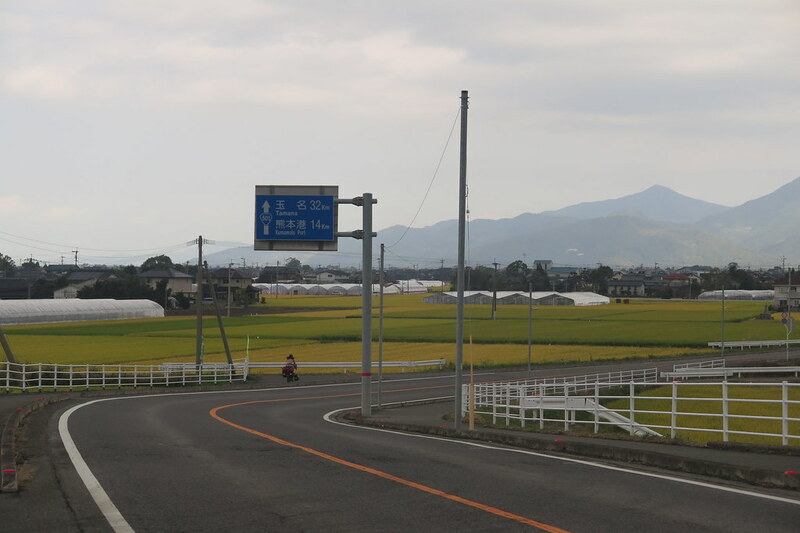 If we connect with #3 less than 15km from Kagoshima, would it be easy to find the cycling path? Which hotel did you stay at, and how much was it (if you remember…)? Hi guys! Hope you’re getting on well. How’s the weather in Kyushu? If you’re coming in from the north, it’d be pretty easy to find that route in. The path just runs alongside the east side of the river that follows route 3 into town. Can’t remember exactly how far out it goes, but looking at Google maps, it probably starts from where the river goes under the Kyushu Expressway. We stayed at Hotel Remm, and it was around 5,000 I think, on a booking.com deal. 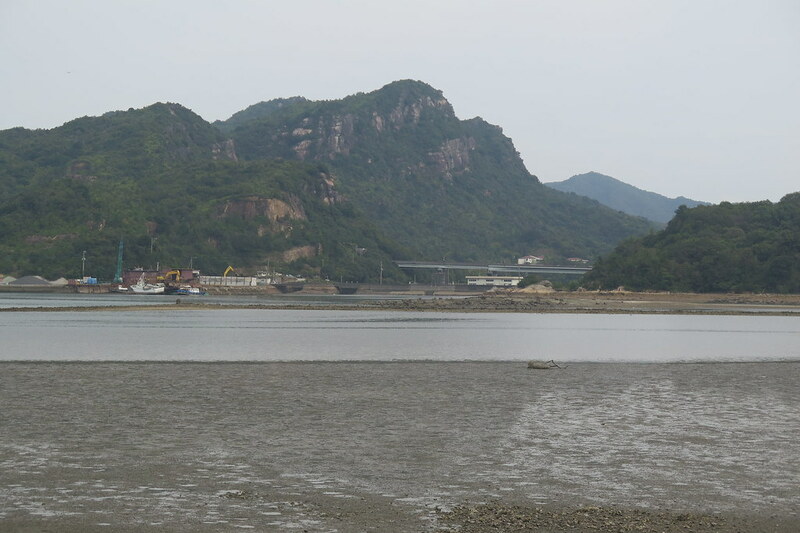 About #3, we’d have to follow the highway itself for about 6km to get to the path, so not sure it’s worth it – it’s hard to see if there is a good shoulder. We take great pains to avoid busy roads, especially now with Neil. Our other option is about 6km shorter and enters on #25. We’ll see what to do, we’ll probably wait a day anyway and let the rain blow over. Enjoy Hong Kong!